Love this coat! I had the pattern traced for a while but then decided I needed to make summer clothes ahead of season. That was smart. But by time I got to this coat, it was too warm to wear it here. I had the fabric in my stash for a few months but was afraid to sew it because I thought it would be too bulky at seams therefore tough to sew and tough to press. The fabric sewed beautifully though (apart from fraying) and my husband made me a clapper for pressing. I think it is my favourite notion! It creased so well with steam, any fabric! Seriously, I think it is the best gadget and will never sew without it again. The other thing I feared was the print of the fabric. In full yardage you could see the panels running down the fabric. The repeats were about 12" wide and I thought it would transfer to the coat. It didn't! I cut carefully but it wasn't really a big issue once the fabric was all cut up. I made a size 36 with no alterations. I used rayon bemberg (stash) for lining. Usually I like to use printed funky linings, but with the leopard print I like a solid colour lining. There is just one simple closure on the outside. Burda suggested 2 snaps inside also, but I just wanted to be done and can add them later if necessary. The one closure holds securely now and this coat won't be worn often anyway. Even though I love it! The dress is Jalie 3024 from last year. It had a flounce on the bottom which I never really liked therefor never wore. Today I cut it off and re hemmed it. Now I really love it and just finished cutting another in a striped fabric. Tomorrow I get to sew. My husband just finished the newest and best addition to my sewing room - my cutting/tracing/fabric storage/work table. A year or 3 ago he made me a work table for the kitchen that is great for kneading bread and folding laundry. I have been using it to trace and cut patterns on. It was very good but I am spoiled and wanted one in my sewing room with adjustable heights. This is the table in the kitchen. The curtains are handwoven by me. I wove for 3 years but then had to quit as it was too physically challenging for me. This is my new table at the lowest position for cutting. You see the tube underneath on the floor? That's where I store my Burda patterns. fabric than I can fit here, I know I have too much! Here is the drawer with all my tracing tools, scissors, markers, tape, weights, rotary cutter and single hole punch. I trace all my patterns, not just Burda. My husband has also made me a sewing table that was customized for quilting. 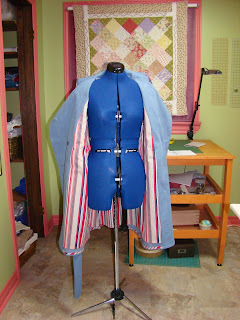 Behind it there are extensions that open up to support the weight of the quilt when quilting. It is also handy to have the machine needle level with the surface. This is the project that got him started in woodworking. We used to live in a 2 bedroom bungalow with no garage. Then I wanted a sewing table but they were so expensive! He said I can make you one better and cheaper. Ha! Now I have a room full of sewing things and he has a garage full of tools. We love our hobbies. Last year I bought a serger so I needed a new table! It is just the right size with 3 small drawers for my serging gadgets. 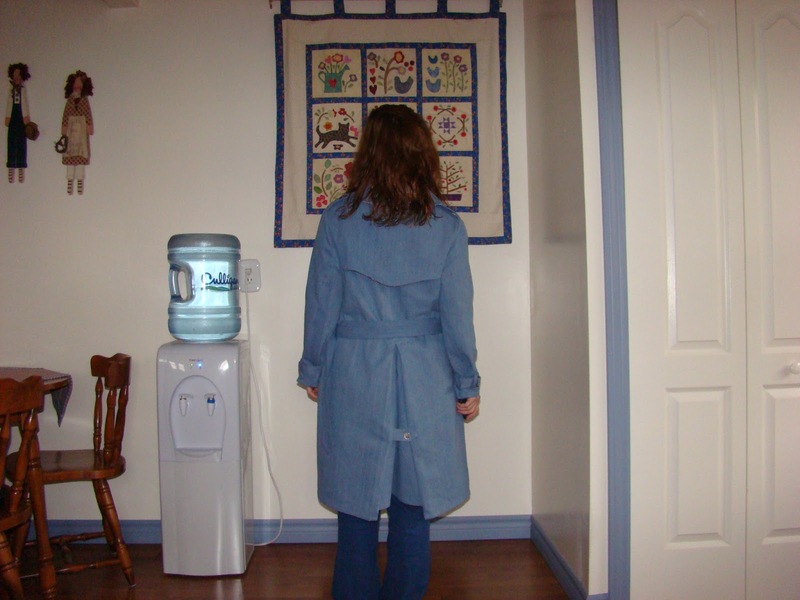 He also made me a jumbo ironing board (from my quilting days). The box underneath with the inlaid heart was made by him and it is where I store my knitting and crochet needles. Here is a better picture of the quilt on the wall. He also installed my 3 way mirror and a long hanging rod for all my handmade clothes. He made me a thread rack and helped me organize my rulers. The only thing about him is he doesn't like to have his picture taken! My sewing room is my favourite place to be thanks to my amazing husband! I loved this coat the moment I saw it in the magazine. 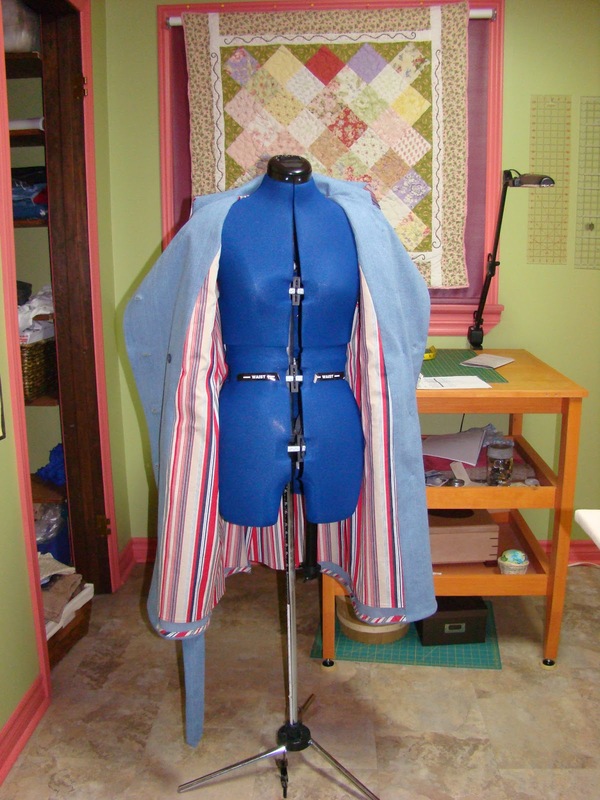 I have made a few coats before so I was surprised that this was relatively quick and easy. I have only made knits from Burda so far and was expecting to have trouble with the famous sparse directions. I didn't understand what they wanted me to do for the hem so I did my own thing and am very happy with it. 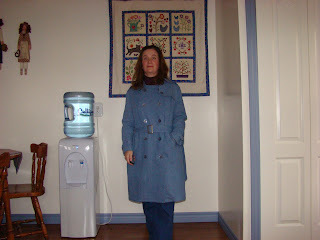 I used the sleeve lining to hem the coat sleeve, (my favourite way to hem sleeves.) The jacket hem was turned and hand stitched with a catch stitch and the lining hem was slip stitched with a jump hem. The back princess seams are lost in these pictures but given a feminine touch to the masculine fabric. I love to contrast different elements in my garments like that. The lining is a flannel that I was concerned about (no slide factor) however I love how it feels so cozy and no static cling so far. I will definitely use flannel again and there are so many print choices. Both fabrics were bought at my LFS with a gift certificate from my sisters for my birthday. This is a size 38, I could have made a 36 but I knew I was taking a chance and played it safe. Now I have something to compare for future Burda coats. Finished sizes Bust 42.5, Waist 37.5 and hip 46.5, sleeve head 20". I shortened the sleeve in 2 spots for a total of 2 inches. Finished sleeve length 22.5.
http://www.burdastyle.com/pattern_store/patterns/army-jacket-102013 Here is the magazine coat with clearer pictures of the details. This is Barbara's Trench, from Silhouette Patterns #1925. I used a ribbed stretch denim and a cotton/poly blend for the lining. I made a size 2 and only shortened the sleeves 3 inches I think. I just cut the length of the bottom, next time I'll know to divide the shortened length between the top and bottom sleeve. I was nervous about my fabric choices, the lining mostly. But I love the weight of the finished coat. I love all the design elements but I am not 100% satisfied with the back pleat. After much fiddling with it I find it acceptable. This coat was not difficult at all. Peggy Sagers the designer has a webcast just for this pattern which origionally fired me up to make this. I love the lining, the welt pockets, the sleeve belts and the rain shield. The worst part was sewing the 18 buttons on at the end. Silhouettepatterns.com is where you can find the pattern and all the webcasts she has done. This coat only took me 1 month to make, it felt much longer. 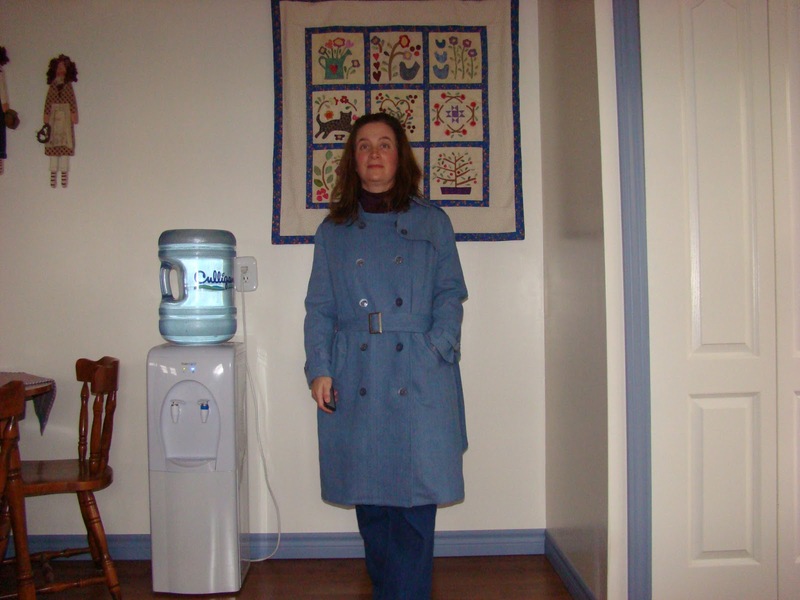 I was making many knits before this so there was much more detail and precision required for this coat.